Yep, still in NYC. (Did you hear that, potential blog stalkers? You will not find my apartment empty this weekend.) I'm disappointed that I'm not running the Flying Monkey, but I made the decision weeks ago without admitting it when I didn't buy a plane ticket in a timely manner. I was so burnt out after Chicago that the thought of a third fall marathon was deathly. Now that I feel like I'm actually physically up to it, the logical part of my brain has pointed out that $400 for a plane ticket, $100 for a car rental, and $200 for a hotel room may not be the best way to spend my meager earnings. Plus, I can't afford the time spent at a weekend away right now. Work has kicked into high gear and I've been averaging about 5-6 hours of sleep a night since the marathon. Even with some sad attempts to catch up on sleep on the weekends, I'm still feeling rather First Fig. 1. Marathon eating. I can become a stunt eater. You know, someone who eats really gross stuff just to get attention. Who am I kidding? I really just want an excuse to eat a McRushmore. What is wrong with me that this looks good to me? 2. Jersey Shore marathon. Time to catch up on all of the delicious antics of those crazy gorilla juiceheads. I kind of think Pauly D is hot. 3. 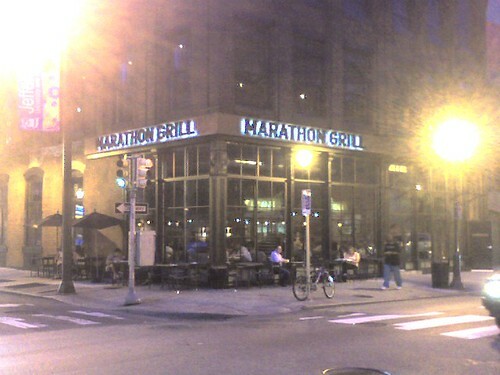 Marathon Grill at 17th & Sansom, my old favorite restaurant. I'll be back in Philly next week and I'll have to go there. Might I recommend you try one of their salads, if you're ever in Philly? 4. Four Loko Marathon. I'm thinking some sort of hour-of-power, but with Four Loko. Who's in? That's my Senator! Quick, drink up, before it's banned! 5. Oh, who are we kidding. I might run the Egyptian Marathon in January, or I might join my friend Aron and train for the Ocean Drive Marathon in March, and I've already staked my reputation (ahem, for what it's worth) on a fresh new bet against my friend Ian for next year's Flying Monkey in November. And while we're at it, I do have guaranteed entry in the NYCM for next year. And the cycle of marathons continues. The McRushmore? Seriously? Only in the States people would call that a one person meal... ;) That sandwich is huge! You post made me laugh!! I seriously am marathon eating still (up 2 real lbs since NYCM) and really need to work on getting faster and keeping fit before i can think about another marathon. i dont want to have my 445 goal die again!!! NYCM 2011 PARTY WITH JEN AND THE SILLY GIRL!! And Jen... I can't stop eating, either. I ordered take out Chinese yesterday and halfway through my noodles I had to say, aloud, "Stop eating, Tracy, you are *not* carb loading." You've run too many races of late. You deserve some rest. You deserve a McRushmore, too. In fact, eat two. But only with a Diet Coke and regular size fries. No fries, Mike, I'm not a TOTAL pig! The anticipation of next year will be huge! We will have to limit media credentials. Love Pauly D! I think your other marathons will be a great substitute. I ran ONE marathon this fall, I can't imagine running TWO, let alone attempt THREE! And there is not way in hell that I would eat that gigantic sandwich. OMG it's HUGE!